Natalie Portman. Benedict Wong. David Gyasi . Oscar Isaac. Jennifer Jason Leigh. Gina Rodriguez. Tuva Novotny. Tessa Thompson. Sonoya Mizuno. John Schwab. Creature Features. Horror. Science Fiction. Action/Adventure. 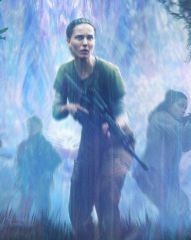 Does the plot in Annihilation even really matter? The film is about the experience, the visuals and audio, the curiosity, the suspense. A world that could only be accessible to us in our imaginations is here brought to life on the screen. It asks a lot of questions but isn't interested in the answers. It's bold, brave, challenging. Some of it is spectacular, some of it less so. Naturally, that will split opinion, but we've become too accustomed to the ready-packaged "Happy Meal Movies" that the studios churn out for us. We're addicted to them like we're addicted to sugary fast food. We should welcome any film that attempts to wean us off that and broaden our palates. This is a proper cinematic film, so what a shame it is that here in the UK (and many other countries) we were denied the pleasure of seeing it on the big screen. I can only imagine how even more beguiling and entrancing the experience would've been. Turn off the lights, switch off your phones, and sit back and feed your imagination and sense of wonder. I know that's why I watch and love films. 8.5/10.